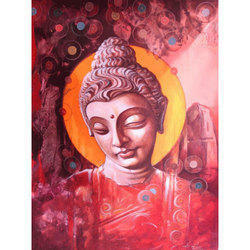 We are offering Buddha Acrylic Painting. A beautiful acrylic painting done on board canvas. Our client can avail from an optimum quality assortment of Achuthan Kudallur Acrylic Paintings which is available in various sizes. With our attractive design, we have created and maintained broad clientele. Being amongst the acclaimed organizations in this domain, we are affianced in offering an elegant designed collection of Acrylic Painting. Dipak Ghosh, 15 X 22.3 Inches, Mix-media on paper. Medium: Acrylic on Canvas Dimension: 19"x22"
We are instrumental in offering Om Acrylic Paintings to our clients, is the outcome of our talented and experienced team of artists, painters, craftsmen, and designers. 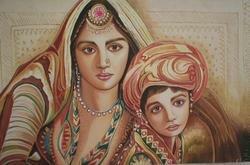 These gifted professionals are well known with the client specific desires and create painting accordingly. Available at market leading price. Size 18 x 18 inch Acrylic on canvas.